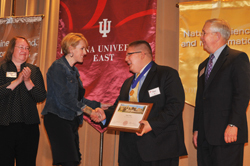 Indiana University East celebrated the accomplishments of its students during the annual Honors Convocation held April 25. Kris Haines, New Castle, Ind. Kelly Coffman is the Naomi Osborne Scholar. The award is given to the baccalaureate candidate with the highest grade point average. Victoria Hicks is the Herbert Presidential Scholar graduate. The Herbert Presidential Scholar program is a prestigious Indiana University-wide scholarship program.